This is a one-day private sightseeing tour by car starting from Varna, Bulgaria to Veliko Turnovo (228 km from Varna), one of the oldest towns in the country. You will visit the following places and will stay there enough time to fully enjoy the area: the old town; the medieval fortress Tsarevets; the temple “St. Forty Holy Martyrs” and some other temples nearby; the Transfiguration Monastery; the architectural reservation Arbanasi. The tour will start and finish at your accommodation in Varna. The tour starts at 8am from your accommodation in Varna. You will arrive in Veliko Turnovo (228 km from Varna) at about 10.30am and will start first with the sightseeing walking tour in the old town. In architectural terms, the appearance of the old part of the town will take you in the past. Walking along Gurko street or Samovodskata Charshia (the crafts streets), you will have the possibility to see 200 years old houses and to enjoy the really unique atmosphere of the place. The market street is a kind of an ethnographic complex with crafts workshops, souvenir shops and galleries. Then you will continue to the medieval fortress Tsarevets, situated on the homonymous peak, surrounded on three sides by the river Yantra. Excavations show that Tsarevets was not a closed fortress, but a real medieval town, in the center of which the following objects were rising: the palace, the church “St. Petka”, multiple residential and public buildings, water reservoirs and battle towers. The Patriarch’s residence was on the highest part of Tsarevets, and the Patriarch’s church “The Ascension of Christ” was also in close proximity. After Tsarevets you will have lunch time in a nice restaurant. Then you will continue with some of Veliko Tarnovo’s famous temples. One of the most emblematic medieval churches is the temple “St. Forty Holy Martyrs”, constructed in honor of the triumph of Tsar Ivan Asen II (1218 – 1241) over the Epir Despot Teodor Komnin (1180 –1273). At the afternoon you will visit the Transfiguration Monastery, one of the most famous and beautiful Eastern Orthodox monasteries, located in the Dervent gorge of the Yantra River, 7 km north of Veliko Tarnovo. It is one of the five stauropegic monasteries of the Bulgarian Orthodox Church. 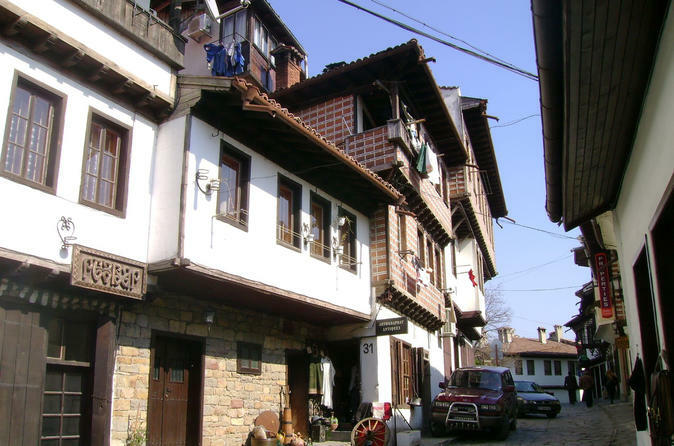 You will continue your sightseeing tour with the architectural reservation Arbanasi, known for the rich history and large number of historical monuments, such as 17th- and 18th-century churches and examples of Bulgarian National Revival architecture. At late afternoon you will sett off back to Varna and your accommodation, where you will arrive at about 8.30 PM.